Bradford Interchange Train Station is 1 mile from the hotel.On the outskirts of Bradford city centre, The Lister offers free Wi-Fi and a modern bar area. There is free on-site parking and access to rail links nearby. The Lister hotel offers 14 guestrooms, all of which are individually decorated in both contemporary and traditional styles. Features include flat-screen LCD TVs with over 30 channels. Continental or cooked breakfast options are available, along with good-value bar meals. The Best Western Guide Post Hotel is 2 miles (3.2 km) off the M62, and offers free Wi-Fi and car parking. It is close to Bradford and Leeds. The hotel has individually designed bedrooms, and superb conference and function facilities. There are 8 designated smoking rooms. Guide Post Restaurant serves first-class cuisine and there is a residents' bar. Friendly and helpful staff are on-hand to ensure you enjoy your stay. 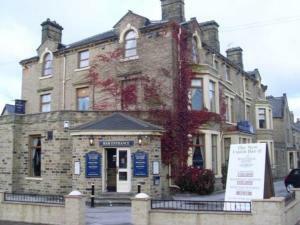 This refurbished hotel offers good-value en suite rooms located opposite Lister Park, 5 minutes from Central Bradford. Each room has an LCD flat-screen TV with Freeview channels and 24-hour room service. Reception is open 24 hours a day for your convenience. In Bradford city centre, Jury's Inn is located on Thornton Road. Spacious rooms all feature en suite bathrooms and free Wi-Fi, there is also a cardio gym and restaurant. Air conditioned rooms all have flat-screen TVs and tea/coffee making facilities. There is also a laundry/dry cleaning service available. Jurys has several accessible wheelchair friendly rooms with wide doors, lowered beds and accessible bathrooms. The modern restaurant serves international cuisine, whilst the Stylish Bar is a more relaxed experience. There is also a coffee bar to start your day, or simply relax in. Jury's Inn Bradford is just 200 metres from Centenary Square and the National Media Museum. With its central location Jury's is perfect for exploring Bradford's excellent shops, restaurants and nightlife. For B&B accommodation in other areas nearby see bed and breakfast in Dewsbury & bed and breakfast in Leeds.